IDPhotoStudio is a very simple to use yet strong application developed to help you adjust pictures to fit ID sizes for numerous countries across the globe, including Austria, Argentina, Canada, Hungary or Peru. The user interface is just easy and that's the ace up its sleeve, as the program can be used by all kinds of users, be they beginners or more experienced ones. Everything's straightforward, so the principal window hosts the required tools for picking the country whose ID sizes you wish to use to customize your photo, the number of photos to be printed and a rotate option for basic editing. About editing, there is no other option for editing the picture, not even a resize or crop tool. The rotating option is the only tool you get in this regard. 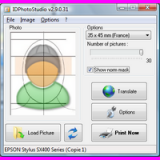 Other than that, IDPhotoStudio offers a dedicated Options button which is nothing more than a printer customization tool, offering you the power to get ready the project for printing. Minimum footprint on hardware resources. Targets both beginners and more experienced users. It doesn't boast so many features. IDPhotoStudio has been tested by Download82.com team against viruses, spyware, adware, trojan, backdoors and was found to be 100% clean. Our editors will recheck this software periodically to assure that it remains clean.